1 drawing on paper ; 6.75 x 4.5 in. 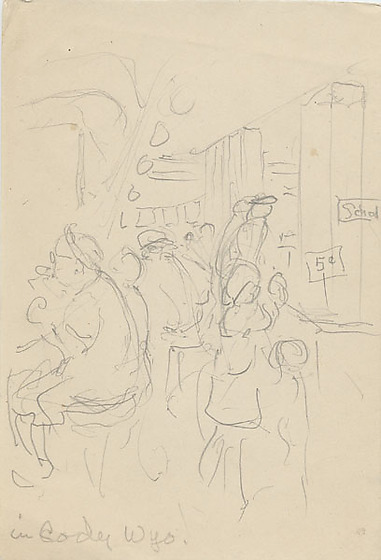 Pencil drawing of a five and dime store and restaurant interior filled with people in Cody, Wyoming. At left, people seated at food counter eating ; man in hat and glasses eating in foreground. Store counter and shelving at right recedes to one point perspective; children in foreground right in front of counter with signs "5 cents" and "School". Written in pencil, lower left corner: in Cody Wyo.